proper gutter installation to adjoining roofs. In my previous page about an extension to an "L" shaped plan I did not go into proper gutter installation methods. In spite of the fact that I personally don't like them and I have never put them into a design where there was an alternative, I accept the fact that there are many box gutters doing a perfect job. So this page is to explain more about the subject of box gutters if they are the best alternative. 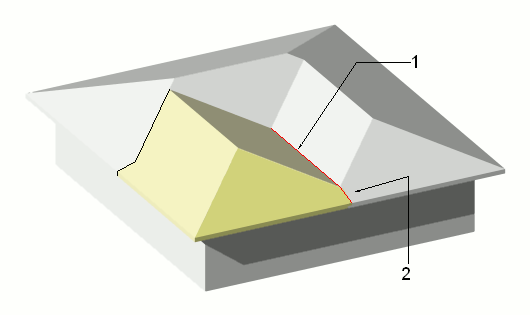 Proper gutter installation - A common house shape with hip roofs. I have drawn here a house with say a 900 overhang at the eaves. We use generous overhangs to provide shade to the walls. 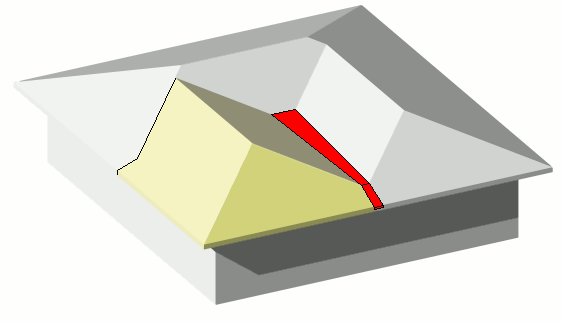 I have had again a query regarding a house extension using the space in an "L" shaped house plan. I had a stab at answering this question before on this page but it was a bit short on details for the option of adding a small roof that included a box gutter. Proper gutter installation - Here is the new roof created that keeps to the original style of the house, with a minimum of disruption to the existing roof surfaces. This is not a bad answer to the problem of putting a roof over an area like this. 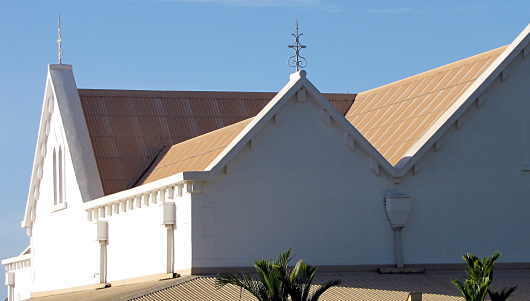 There is a minimal amount of work to be done to the old roof surfaces. Straight away though you can see that the area denoted by the red line marked 1 on the sketch would be a problem. Where two roofs meet like this a box gutter has to be installed. Also you can see a line marked 2 on the sketch. 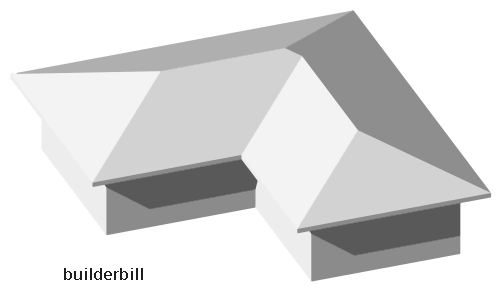 This shows that I have chosen to place the join of the two roof surfaces directly over the existing wall. I have done this for a couple of reasons. Strength. The new roof framing can sit on top of the wall. If I had made the join at the fascia, not only would it be inconvenient structurally, but the ceiling height in the new room would be reduced. Proper gutter installation - So as a fairly general rule we have to cut back the eaves overhang where the new room is to be situated. I have shown here the roof cut back to say within 100 of the wall outside face. It is always good practice to only cut back what is necessary and leave as much "meat" as possible where the rafters or trusses are connected to the wall. 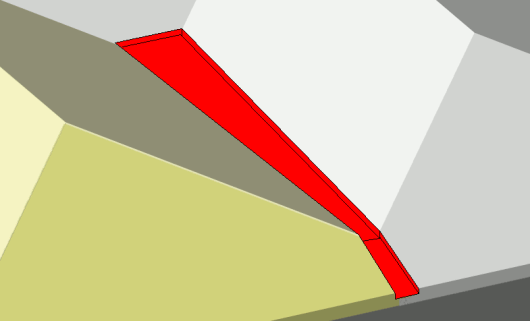 Proper gutter installation - The red line marked (1)in a previous sketch shows the junction between two parallel roofs to be level, but of course we need a fall to shed the water quickly and this is how we do it. Proper gutter installation - Here is a close up of the box gutter. As the gutter rises it also has to get wider. This is no big deal from an appearance point of view, as it won't be seen at all from ground level. 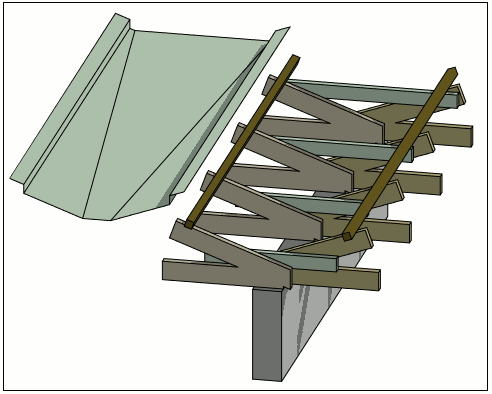 Proper gutter installation - A sketch of a method of framing the gutter. When I was drawing this I was thinking about a cement tile roof, so I have shown the bottom row of tile battens. Also I have shown the shape of the pressed metal box gutter ready to be dropped into position. Note that it goes over the tile battens. (Which means under the tiles). In the old days we would use 25 thick boards to support the pressed metal flashing to stop it distorting when walked on. A far better way is to increase the thickness of the metal to say 1.2mm. This in effect makes the gutter deeper and so more effective. proper gutter installation - Alternative detail for gutter. If for fixing reasons of the roofing it is not possible to run the gutter over the battens, then it is normal to turn it back over itself. The main thing with these types of gutter is to get enough gutter slope. Also I like to see them wide enough so that it is easy to clean leaves and rubbish out of them. I have often cut an ordinary household brush down to say 100 wide to clean out valleys and box gutters. All too often roofers fix the sheeting leaving barely enough gap to get a hand inside the valley let alone a decent sized gutter brush. The photo below while showing a different layout, is shown to illustrate a couple of important points. The sketches above show that the catchment area for valley is quite large and yet it has to lead to a small outlet which could be prone to overflowing. The answer is to make the outlet larger, leading into a collection box which in itself may overflow at times, but it is outside of the building line, so any overflow is not damaging. The collection box makes it easy to clean the place where clogging by leaves etc. is most likely to occur. Also note that where the rainwater downpipe leads onto another roof surface it is good practice to run it into a horizontal pipe with outlet holes that diverts the stream over a wider area. Proper gutter installation - A grand old house that has a similar roof, but with gable ends and parapet walls.